Over the weekend I finished knitting the shawl and blocked it! It turned out really, really good; I am so proud of this! 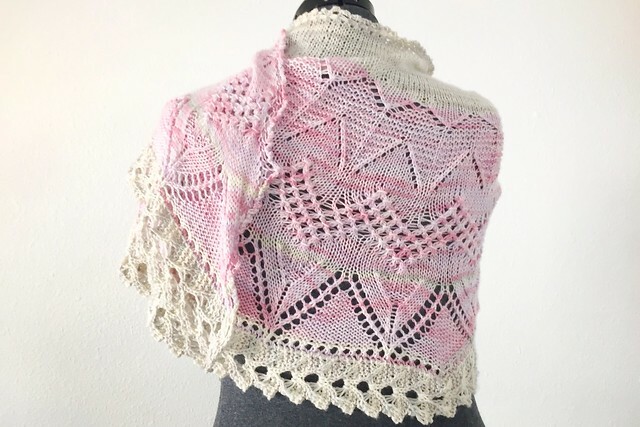 The pattern I used for this shawl is Follow Your Arrow 2 by Ysolda Teague; I followed choice 'A' for each of the five clues. The yarn is Knit Picks Stroll Tonal in Pearlescent and Seashell; they go so well together! Now that I've finally finished this shawl I'm trying to figure out my next few knitting projects. I've still got to knit a blanket for my 2015 crafty resolutions and there may be another shawl in my near future.